With all the rumble about Solr, Elasticsearch and other search vendors like Coveo, Attivio one could easily forget about that long existing behemoth in the (enterprise) search niche: HPE/IDOL. 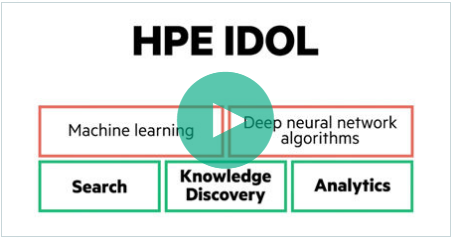 IDOL stands for “Intelligent Data Operating Layer” and is a very sophisticated big data and unstructured text analytics platform and has been around for more than two decades. Recently (december 2016) HPE added machine learning and Natural Language Procession to the capabilities. IDOL can be used for knowledge search, e-commerce search, customer self service search and other use cases that require fast, accurate and relevant search. So IDOL is still very much alive and kicking! Looking for a specialist that can support you with first class search and text analytics based on HPE IDOL in the Netherlands? KnowledgePlaza Professional Services is a fully certified HPE Partner. This entry was written by Edwin Stauthamer , posted on woensdag februari 08 2017at 02:02 pm , filed under Marktontwikkeling, Technologie, Vendors and tagged Haven OnDemand, HPE, IDOL . Bookmark the permalink . Post a comment below or leave a trackback: Trackback URL.